Location: Situated in a churchyard on the N side of the A5104 at the N end of Penymynydd in an area also known as Pentrobin. 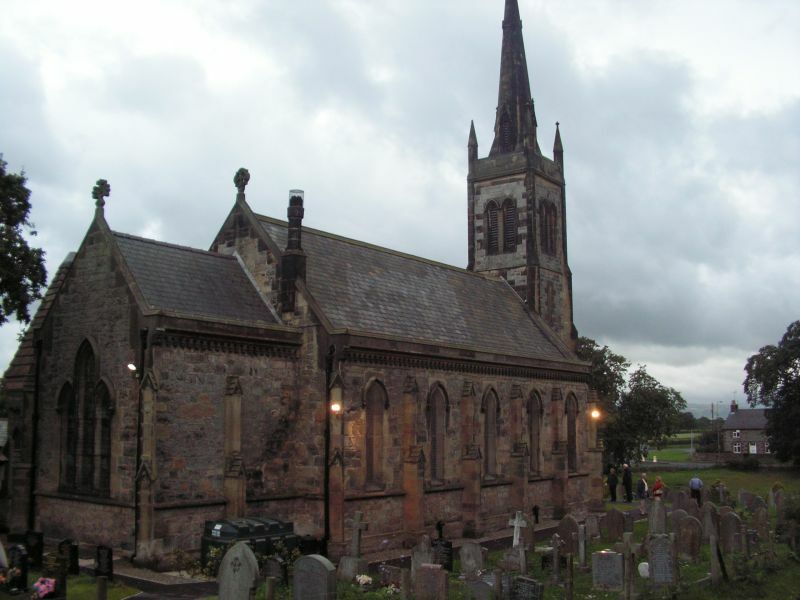 The church was designed by John Buckler and built in 1843 at the expense of Sir Stephen Glynne of Hawarden. The interior stencilled and painted decorative scheme was executed by Rev J E Troughton, priest-in-charge 1843-64, partly to the designs of R P Pullan, brother-in-law of William Burges. The paintings include scenes copied from work by Friedrich Overbeck. The decoration has been overpainted and restored in places at various times. Robert Heaton restored the chancel roof 1979-80 after it was damaged by fire. Gothic Revival style with Early English detail. Coursed dressed stone, slate roof. W tower with entrance in the W face, paired louvred lancet bell-openings, corner pinnacles and a slender spire with lucarnes. Aisleless nave has lancet windows with label moulds which alternate with stepped buttresses. Lower chancel, and attached to it on the south side is an octagonal vestry with a steep pyramidal roof lit by lancet windows. Nave and chancel have arcaded eaves cornices and crucifix gable finials. E end has a triple lancet window. There is a stone arcaded gallery at the W end which has a range of 5 open arches surmounted by a parapet with blind arcading. Beneath the gallery on the S side is a baptistry with a stone font with a moulded stem and a circular bowl with vigorous foliated carving. An elaborate oak crocketted pyramidal lid is attached to a lifting mechanism supported by a full-height wrought-iron bracket with finely-executed foliated scrollwork in the angle. There is a false hammerbeam roof which has discreet painted decoration in the nave and more elaborate gilded and painted decoration and stencilled panels, as well as painted carved angels, in the chancel. Stone chancel arch with an elaborate painted screen which has arcaded panels with paintings of saints surmounted by open traceried arcading. On the N side of the chancel arch is an organ and on the S side a circular stone pulpit with a moulded base which has blind arcading with paintings of angels and is entered from an arched opening in a stencilled surround in the E wall. Pews have poppyhead finials. The whole of the interior with the exception of window reveals is decorated with elaborate stencilled designs and texts. This frames painted scenes between the nave windows, and further painted scenes include Christ in Glory over the chancel arch and Christ’s baptism over the E window. The E window is by Powell & Sons, 1910 and most of the remaining stained glass is by Troughton who painted and fired it himself. Listed grade II* for the exceptionally rich interior which is an interesting and early example of adoption of Puginian and Ecclesiological ideas in terms of style and interior decoration. Group Value with the Old Parsonage. Situated in its own grounds c500m NW of St. John the Baptist’s Church, reached from a short drive running E from the A550 at the N end of Penymynydd. Facing the road behind a hedged front garden.